If you long for a Dynasty Warriors title without the need for hack n' slash this could be a game for you. The Dynasty Warriors series and Musou games (including various licenses based on the same gameplay concept, as well as Samurai Warriors) are starting to get a bit out of control. There is a tremendous number of games out there, so in a way it's nice that we get a new Dynasty Warriors title that's not part of the main series and doesn't offer up the same brand of hack 'n' slash, while offering up many familiar characters, high drama and a fantasy twist. Godseekers is in effect a strategy-RPG and an extension of the series as it offers up turn-based combat along the lines of, say, Fire Emblem. If you wanted a strategy-RPG take on Dynasty Warriors, this is it as it takes the Empires editions further and focuses completely on turn-based strategy. The story follows Zhao Yun, and his sidekicks Lei Bin and Lixia, both newcomers to the series. As usual it is loosely (and perhaps more loosely than usual) based on The Romance of Three Kingdoms, this time following things from Zhao Yun's perspective. Lixia adds a different sort of flavour, her mystery and origins are key to the plot as she tries to collect five orbs than once helped her defeat a deity. At the start of the game she is in stasis, but Lei Bin breaks the seal and Lixia decides to tag along with him and Zhao Yun as she also tries to learn more about humans while trying to regain the orbs that have fallen into the hands of several key players in the conflict. This won't be straight forward and the plot is a dizzying back and forth of betrayals, temporary alliances, and well, the sort of things you'd expect to see really. For someone who's not entirely familiar with the source material it might get confusing, but the storytelling is rather to the point, perhaps a concession to the game doubling as a handheld title on PS Vita, but one that also serves newcomers to the fiction. 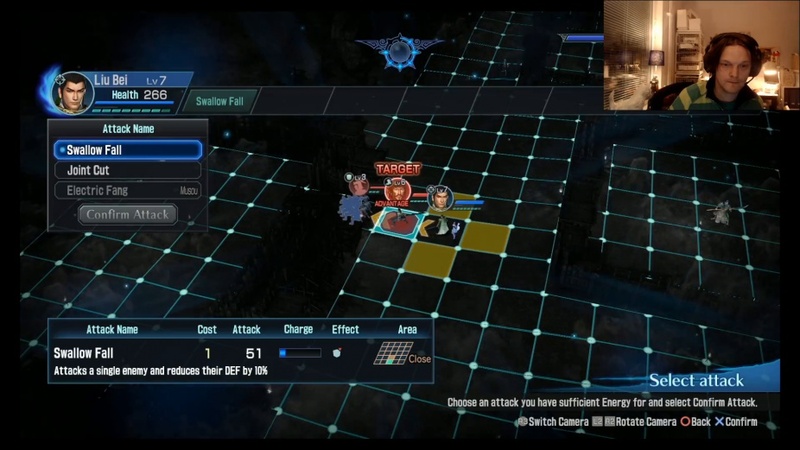 Speaking of the PS Vita connection, it should be noted that Dynasty Warriors: Godseekers won't win any prizes for pushing the PS4 hardware to its limits. While the pre-rendered cutscenes are nice to look at the actual in-game visuals come across as very mundane on your large TV screen. It's not a huge problem as visuals aren't what you primarily look for in this sort of game, instead what's key is that the maps are immediately readable so you can formulate a plan quickly. That said you should expect more in terms of visuals from a full price title. In many ways this title feels more at home on the portable format, even if some missions that are part of the main campaign do take a while to resolve. But particularly the nature of the grind-heavy optional missions, that mainly serve as an excuse to boost your character levels and score loot, are a perfect fit if you've got an extra five minutes to kill as you wait on the bus. In many ways the strategy component is fairly straight forward. The objectives of a mission typically involve defeating one, two, or more opposing officers. And overall, while you can turn up the difficulty to hard, you'll rarely fail as you've got a wealth of options and there's no permadeath to consider (as you would in Fire Emblem or Xcom). One big difference, however is that your characters have attacks that target very different areas. Some may hit enemies three tiles high, others three tiles wide, some could target one tile in front, behind and to your sides, whereas yet others offer different alternatives. Lei Bin, who you'll control for much of the game, has ranged attacks and a couple of them (as well as one musou attack) targets five tiles, a star shape of sorts, and naturally he's great at quickly taking down large groups of enemies (and building up that all important synchro meter, more on that below). The key mechanic here and what sets Dynasty Warriors: Godseekers apart is the Synchro attack. These potentially massive coordinated damage inducing attacks are perfectly in line with the absurd overkill situations you find in the main series and lining up a full synchro (with five characters) and mowing down rows upon rows of enemies (sometimes killing them several times to make sure that synchro meter fills up again for the next turn) is incredibly satisfying. In many ways making sure you build up synchro and maximise its effect is a lot more important than other potential strategies such as flanking and keeping weaker units protected. This isn't a strategy game where you need to think defensively, rather it's all about maximising your offensive output. After a while we set up our characters in a way that those who could had "flurry" skills equipped, which gives bonuses towards your charge that powers the synchro meter. That way we rarely had to play more than a round or a round and a half before we could start unleashing synchro attacks. It can feel overpowered to the degree that it feels slightly unbalanced, but if you then skip side missions and raise the difficulty you can still find a challenge in the story missions. The fact that you can use gold to temper (i.e. raise the attack level of your weapon) without much in the way of limitations also means that if you're really maxing out your characters and their gear you'll breeze through most missions with ease. We were saying that most maps have rather basic objectives, but some are more elaborate as you may have to hold a position, escape, or activate an Orb (basically making use of one of the five elements) in a specific spot. There's always a sense of heavy scripting. As we sit here having written most of the review we're a bit puzzled at how this game had us hooked. Clearly, it is not perfect. But it's got a very addictive mix of elements whether you take satisfaction in pulling off insane synchro moves, or whether you want to unlock the various skills and perks for the numerous characters, or whether you want to unlock certain characters for free use (after they've played out their role in the story), there is a ton to engage with and the campaign itself spans ten rather lengthy chapters and there's countless side missions to grind out. We've spent dozens (that's plural) of hours on this game and there's still more to be done, more trophies to collect, and more to unlock. If you enjoy a good Dynasty Warriors soap opera full of retreating enemies, backstabbing allies, betrayals, and stern and honourable warriors, as well as a deep, yet slightly unbalanced turn-based strategy mechanic, you might want to look closer at this game, particularly if you're looking to add a strategy game to your Vita library. Massive campaign, Lots of familiar faces, Interesting skill trees and character unlock system, Synchro system is addictive. Visuals leave a lot to be desired, Most missions tend to be a bit similar, Feels a bit unbalanced once you've figured out how to max out the Synchro system.